Brighton (pop. 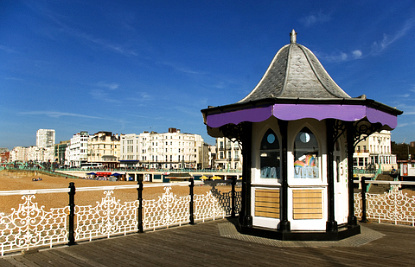 188,000) is one of the most popular seaside resort in England. It has long been a favourite of the well-off from London and other hedonistic revellers. Brighton has always been synonymous with party since Prince Regent (later to become King George IV) came here to lead a life of debauch and luxury. It is him who commissioned the gobsmacking Royal Pavilion. This exotic Mogul-Indian palace may seem well out of place on a beach in southern England, and its Chinese interior even more outlandish. 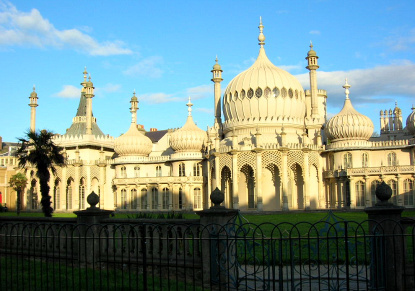 Imagine the reaction of the locals (that is, all Europeans, not just Brightonians) when they saw these proud bulbous domes at the time of the pavilion's completion in 1822. The main sight is obviously the magnificent Royal Pavilion (open October to March 10.00am-5.15pm, and April to September 9.30am-5.45pm; last entry 45min before closing time; admission £5.35). Brighton's second most popular attraction is the Palace Pier (open all year-round from 9am to midnight; admission free), which has plenty of amusements, restaurants, bars. There are a few good museums in town. The recently renovated Brighton Museum & Art Gallery has 20th century arts (including Dali's famous sofa in the shape of Mae West's lips), and even an authentic Hindu shrine in the world art section. The Hove Museum & Art Gallery has exhibits ranging from toys to contemporary craft. 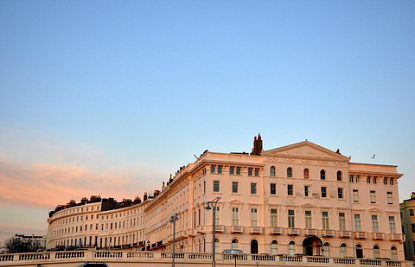 Hove (Brighton's twin city) is also the birthplace of British cinema, as the museum witnesses. The bizarre looking Preston Manor, built in 1600, rebuilt in 1732 and remodelled in 1905, has some 20 rooms open to visitors filled with various antiques and paintings. A few km North of Brighton's centre, the Booth Museum of Natural History keeps about half a million dead stuffed animals. 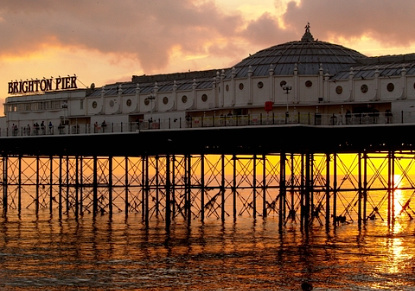 Brighton is 85km due south of Central London, and about halfway between Hastings and Chichester. The M/A23 motorway connects it to London. Trains runs between Brighton and London's Victoria or King's Cross stations (50min, £15.60), Portsmouth (1h45min, £7.50), Chichester (45min, £8.20), Hastings (1h15min, £12.40) and Dover (3h, £23.50). National Express has direct buses to London (1h50min to 2h30min, £9.30), Chichester (2h30min, £3.20), Portsmouth (1h45min to 3h30min, £3.20), as well as one daily bus to Arundel (50min, £4.30). Local bus No 711 goes to Dover via Hastings.